Officer Jared Williams is a totally unfit for the job loser who obviously is a bully and coward and can’t pick on people his own size. 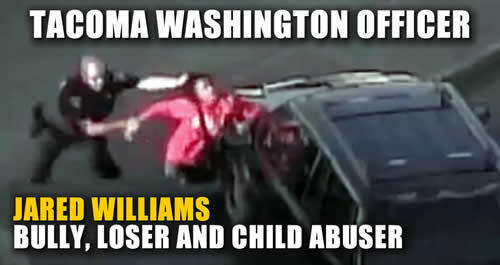 It’s morons and losers such as Officer Jared Williams who should be fired, prosecuted for assault and child abuse. Thank god for video because this is the type of criminal in uniform and will lie and distort the facts. Any police agency that hires trash like this should have it’s POT status removed. Even though Monique Tillman, now 17, knew what had happened to her during an encounter with a Tacoma police officer Jared Williams in a mall parking lot two years ago, seeing the video for the first time was staggering. “I was absolutely in shock, anger and disbelief,” said Tillman, who is black, about the video that shows the white officer Jared Williams pulling her around by her hair, throwing her to the ground, tasing and arresting her. Tillman filed a lawsuit in Pierce County Superior Court seeking unspecified damages from the officer, the private security firm he worked for and the owners of the mall. The officer couldn’t be reached for comment Wednesday, while the other parties declined to comment. The suit is being filed at a time of rising pressure on police departments to increase officer accountability for the use of force, and amid a burgeoning Black Lives Matter movement that emerged after a series of killings of black people by white police officers in cities across the country. About 100 people march outside of the Tacoma Police Department Monday, calling for the firing of a Tacoma police officer Jared Williams who has been sued by a 17-year-old girl. Monique Tillman alleges officer Jared Williams’s behavior amounted to brutality when threw her to the ground and used a stun gun on her in the Tacoma Mall parking lot, while working off-duty security there. In the suit Tillman alleges Williams stopped her May 24, 2014, — when she was 15 — as she and her brother were riding their bikes home through the mall parking lot. He allegedly told her she was being banned from the mall for causing a disturbance. She asked why she was being stopped, and as she tried to leave, he tossed her “around like a child’s doll, slamming her into parked vehicles, forcibly shoving his forearm into her chest, grabbing her by the hair and body-slamming her into the pavement,” and he used the stun gun when she was on the ground, according to the lawsuit. The suit also names Simon Property Group (the Delaware company that owns and operates the mall) and Universal Protection Services, a California company hired for mall security.